IENE participated in the high-level "19thInternational Energy Arena” conference, which was held on September 21, in Istanbul. The theme of this year’s conferencewas "Energy: Geopolitics, Trends and Challenges”, focusing on important topics, including energy investments and financing issues, geopolitical developments, highlighting energy security and bilateral relations as well as recent developments in Eastern Mediterranean, Balkans and Turkey in terms of gasification of Europe. IENE was represented by its Head of Research, Mr. Dimitris Mezartasoglou, who attended this meeting and presented the supply prospects and market realitiesin advancing gas use in SE Europe. In this context, IENE had the opportunity to share its knowledge and expertise with a broader group of energy experts. Mr. Mezartasoglou referred to the latest developments in SE European gas markets and the "Prospects for an Expanded South Corridor”, as a number of major infrastructure projects are currently underway in SE Europe, which will facilitate the introduction and further use of natural gas in this broader geographical area. The concept of an Expanded South Corridor includes all major gas trunk pipelines, LNG regasification terminals and UGS facilities which will feed gas into the system which will then be directed towards the main European markets. In addition, this Expanded South Corridor with its multiple gas entry points and linked underground gas storages and LNG facilities, will provide the necessary gas quantities for the operation of regional gas trading hub(s) thus strengthening the security of energy supply but also enhancing regional gas trade. The conference was attended by senior representatives of research centers and energy companies from Russia, the US, Azerbaijan, Iraq, France, Israel, Cyprus, Egypt, Lebanon and Turkey, among others, while Ms.Erika Olson, Economic Counselor, US Embassy in Ankara, Mr.Mithat Rende, former Ambassador of Turkey to Qatar, and Mr. Matthew Bryza, former US Αmbassador to Azerbaijan, actively participated in its proceedings. 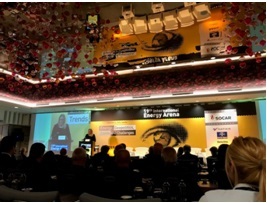 SOCAR was the main sponsor of the one-day conference, organized by Turkey-based Strategic, Technical and Economic Research Center (STEAM), whereas Natixis, Tekfen İnşaat, Deloitte and Ankon Consulting were the remaining sponsors.